quotations C&F Iranian port. Bank ref: Vereins-Und Westbank A.G., Hamburg. ABKO D). Cable: ABINEX, Hamburg. Phone: 040-280 3232.
tonsfor the production of compound feedstuffs. Packaging in bulk or bagged. as per availability. Full analysis required stating following data: min. 42573. Phone: (91) 455 3628/455-3635. Succ., S.A., Boomsesteenweg 949, B-2610 Wilrijk (Belgium). Telex: 31618. Cable: MUNAR, Antwerp. Phone: 031/28.20.00. Montevideo. Contact: Dott. Alberto Levi, Sirce, Via Larga 23, Milano, Italy. Telex: 310288 SIL SIL. Phone: (02) 861451. CIF Malta prices, catalogues and/or samples. Contact: John Wismayer, A. C.
Wismayer Co. Ltd., 62 Old Bakery Street, Valletta, Malta. Phone: 627110.
and canning; mung beans 50 kg or 100 Ibs bags, for sprouting and repacking. Bank ref: Royal Bank of Canada, Portage and Arlington Branch, Winnipeg. 1372- Prunes, almonds, filberts, figs, raisins, dried peaches, chestnuts (Venezuela). 15 mt of dry figs; 50 mt of raisins; 10 mt of dry peaches; and 10 mt of chestnuts. 24301. Cable: INVER, Sarrapia. Phone: 72.74.62 and 72.29.59. No. 513 or Casilla 6097, Correo 22, Santiago, Chile. Phone: 67524.
varieties of pistachio nut seeds for adaptation to Ecuadorean conditions. Road, Central, Hong Kong. Telex: 85267 TAIHI HX. Phone: 5-457191 or 5-437191. HUMANE. Phone: (07) 241-3109 or (07) 241-3100. Mississauga, Ontario L5C 1K3, Canada. Phone: (416) 275-6485. Cable: GIRIRAJ. CIF, FOB. Bank ref: Philippine Trust Company and Philippine National Bank. Phil. Heart Center For Asia, East Ave., Diliman, Quezon City, Philippines. Telex: 63767 RAWMAT. Cable: RAWMAT, MLA. Phone: 96-83-86. Modesto, California 95355. Phone: (209) 529-8150. Telex/TWX: 510-761-8022. 1388 Joint venture (Nigeria). Interested in a joint venture enterprise with U.S.
Over, Yaba, Lagos, Nigeria. Phone: 845014. Cable: CARRISBIS, Lagos. Import/Export, Hansa-Str. 17, 2000 Hamburg 13, West Germany. Phone: 040-45 69 26. Japanese and Pakistani companies. Product literature and C&F price list desired. Seoul 100, Korea. Telex: DAELECO K23304 ATTN: Mr. Hahn. Phone: 94-5049. Hamburg. Phone: 040-75 15 31. 46 Jerfaella, Sweden. Phone: 0758/383 83. 1394 Combat rations (Venezuela). Wants combat rations, meat, fruit, cake, eating . 2.6 x 2 x 12.18 M), rations of 1,100 calories, 6 rations per case of 24 Ibs. certificate of country of origin will be required. Quote CIF La Guaira, Venezuela. Plaza La Americas, Caracas 106, Venezuela. Telex: 24256. Phone: 92.72.35. 962775. 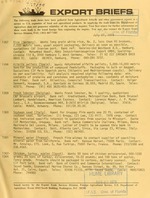 Telex: CAIRO 92628 UN. Kilbane Street, Fleetwood, Lancs, England. Telex: 677381. Phone: 039-1778311.
est food exhibit in the U.S. which is geared strictly for the export market. 1977/78 and 1978/79 Marketing Years, FFVS 6-79, July 1979.